← Need to find an EP church? This entry was posted in Questions and tagged Exclusive Psalmody, instruments, music, musicians, worship. Bookmark the permalink. I think that we would have to expand this to other talents as well to get a grasp on the implications of this if it were so. There are many talents that are not permissible to be exercised in the worship of God. I think that we err if we somehow separate music from those other talents. Since musical instrumentation has been done away with in the worship of God it now stands on the same plane as other talents. I think that sometimes we can elevate musical instrumentation to a greater level than it should be. Obviously it was not on the same plane in the Old Testament as it was commanded in worship. But it has now passed away with the sacrifices. We could just as easily say that New Testament worship has a negative effect on the butcher because he cannot utilize his talents for cutting up an animal in worship. We don’t because there is more of an attachment in our society with music. Secondly, even in the Old Testament, the use of musical instruments was restricted. It was only the Levites that were able to use them. Therefore, if the argument is made today that some in New Testament worship are restricted from using their talents in worship, it was the same in the Old Testament. I am sure that there were many men and women that were talented in the use of musical instruments in the Old Testament, however they were not permitted to use their talents in worship. We hope to teach our daughters music as there is much enjoyment to be found in playing different instruments but we know this is something that will not be used in the worship of God. Thanks for posting this Mark. It is a good question that those of us who are acapella EP must answer. Would you encourage your daughters to sing Christian songs when they learn music? Would that not be a little inconsistent. If you do not, would they not be drawn to make music for those songs which do not glorify God? For eg. in my city, guitar is very closely associated with Rock music. So, if my children want to learn guitar I fear that they would start singing these blatantly ungodly songs. On the other end, I am not sure with what amount of theological consistency I can ask them to sing Christian songs since instruments have been abrogated in all forms of worship ( Public, Family and personal). Just some questions. Hope you can throw more light on them. I hope to answer your questions to the best of my ability. Would you encourage your daughters to sing Christian songs when they learn music? Yes. As long as they are doctrinally sound songs, I personally see no problem with this. They will not sing them in a worship context but I see no problem with them playing instruments and singing songs with Christian lyrics around the house or with some friends. Would that not be a little inconsistent? I don’t think so. I look at it this way. In worship, my wife is not allowed to speak. When she is not in a worship context, she can speak of God even praise Him audibly for a great thing that He has done in her life. Some say that all of life is worship which in a sense is true. But if we take this too far then my wife would have to be a mute because she is to keep silent in worship. But she is told in this text to ask her husband at home. She is still talking about God but the context is different. I say all of that to say that I have a similar view on instruments and Christian music. Music is a form of expression. If we can speak of God in some contexts but not in others why is music not the same way? Music itself is not inherently evil. If one is a musician and they are a Christian then they will obviously see things from a different viewpoint than a lost person. This different viewpoint will come out in the songs that they write. This is only natural. I just think that we are reaching if we consider every time the name of God or a Christian theme is mentioned to be a time where instruments are abrogated. Discernment must be used in this as we can go too far with our freedoms as well. If my family starts doing music and we invite people over and I begin with a prayer, have we now begun a time of set worship? Probably so and we should put the instruments away. There are obviously some things that are evil in every context, such as idols. It doesn’t matter what context I am in, I should not set up an idol. I don’t think musical instruments are in this category though. That is just my humble opinion that I am sure others may disagree with but this is where I am with the light that I do have at this point in my Christian walk. Thank you for your very helpful reply. I really appreciate it. It helps me a great deal to think better. Your reply clarifies a lot of things. I’m curious, do EP churches actually sing Psalm 149 & 150? If the Old covenat allows insrumentation to praise God aren’t we limiting the New if we say we can’t use instrumenatation in the New? The EP churches do sing Psalm 149 and 150. The point is, instruments were as much a part of Temple worship as animal sacrifices were. That is why they have been abrogated with the advent of new covenant worship. You may want to listen to these set of lectures. I really like this question because it bothered me for some time. Many people have focused on the musical instruments in this passage but overlook the context in which they are mentioned. If we are literally supposed to sing with the timbrel and lyre (Psalm 149:3), then are we literally supposed to get swords and shackle the leaders of our country? (Psalm 149:6-8) If we are literally supposed to praise Him with resounding cymbals (Psalm 150:5), then dogs, cats and cows (which have breath) are disobeying God by not praising Him. (Psalm 150:6) We can’t choose one part to be literal and the next to be figurative, picking and choosing how they apply. Great question. I’m going to start singing these more. Thanks. We worship God as He desires. We do not worship Him in ways that just seem good or easy to us. Excellent, Mr. Lanier. I was wondering what Scriptural support there could be for such things because I have noticed that most of the Puritans and Reformers of the past have said that there is room for non-Psalm (or non-inspired) music (outside of worship, of course). I’ve been thinking about this question since it was posted, but the best I could come up with as far as Scriptural reasoning goes was merely an argument from analogy (e.g., we read devotional compositions outside of worship, so why not listen to a musical one?) and an argument that there is a difference between performing or listening to music and offering up said music as worship. Spinning off something you said, there seems to be a few different categories of Christian music. (1)There are songs written by Christians that are not inherently religious in nature. (2) There are songs written by Christians which mention God or religious things but are not meant as worship song. (3)There are songs meant to spread (Reformed =D) propaganda. (4)There are songs meant to help people memorize Scripture or to teach doctrine. (5) There are songs which are meditational or devotional in nature. (6)And then there are songs which are (misguidedly) meant to be used in the worship of God. The first two categories of songs are obviously outside of the scope of the Regulative Principle and so are fine. The next two fall under the regulative principle in that the doctrine they teach or propaganda they spread must be true and the Scriptures memorized must indeed be the Scriptures. It’s the last two which get tricky and possibly also the songs meant to aid the memory of Scripture has some sticky issues to it. Firstly, the question to raise is whether meditations or devotions are a part of worship? If not, then the only problem is what to do when musical meditations or devotions take the form of praise? Can they or should they? Nextly, the question must be raised whether it is possible to sing a song which was meant (whether rightly or wrongly) to be used in worship without offering it up as worship? What if the portion of Scripture to be memorized happens to be one of the songs of the Bible outside the Psalter? Are there some songs which, in and of themselves, when sung or listened to are seen by God to be offered up in worship to Him? If so, then we need to look at it from another end also. How about musical meditations which people offer up in worship that were never meant to be offered up in worship? Does authorial intent matter? If so, how could we tell authorial intent in some cases? Are there some songs which, in and of themselves, when sung or listened to are seen by God to **not** be offered up in worship to Him because they were merely meditational or devotional in nature and were never intended to be offered up as worship? So the major question then is: Is it lawful to sing or listen to something that takes the form of praise (even inspired praise in the case of the Psalms and the setting to music of Scripture in order to aid in the memory of Scripture when such music happens to fall into the songs outside the Psalter in Scripture) without offering it up as worship to God? If yes, then the implication seems to be that the Psalms themselves could be used outside of worship–unless of course I’ve messed up in my reasoning somewhere or am forgetting certain portions of Scripture. Obviously, this question does not affect the cases mentioned earlier (1-4 minus the forms of praise in Scripture outside the Psalter), and thus there could be many kinds of Christian songs which do not fall into these sticky issues (I know of many of them myself). Just some more thoughts to add to the discussion. Excellent thoughts. As Mark said, each of your question deserves a careful attention and a thoughtful response. John, Venkatesh and Tom, your discussion has been very edifying. I was reading back over the responses to this question and your posts were very thought provoking. John, great points on the restriction of instrumental use in the Old Testament and the reference to 1 Corinthians 14. Tom, thank you for the reminder that singing a capela actually requires us to learn more about music, rather than less. Raymond, great questions. I will have to think on some of those for a while and perhaps start another question thread. I agree that the Yahweh Elohim commands His elected, redeemed, and regenerated church to sing the Book of Psalms exclusively. However, the Holy Scripture does not teach that Yahweh Elohim abhors, condemns, or forbids the accompaniment of musical instruments. Without question, the Old Testament commands the saints of the Most High God to sing the Book of Psalms with the accompaniment of musical instruments. But the same is true in the New Testament. For example, Ephesians 5:19 commands the saints of the Most High to: “singing and making melody in your heart to the Lord.” In The Complete Word Study Dictionary: New Testament, “making melody” is psállō, which denotes “to touch lightly, twang or snap. 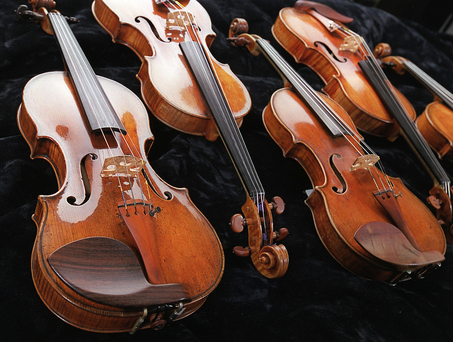 To play a stringed instrument or to sing a hymn.” Greek Scholar Spiros Zodhiates explains and expounds: “Musicians who play upon on instrument were said to pluck strings or simply pluck. The word came to signify the making of music in any fashion. Because stringed instruments were commonly used both by believers and heathen in singing praises to their respective gods, it meant to sing, sing praises or psalms to God whether with or without instruments .” The same Greek word is used in Romans 15:9, 1 Corinthians 14:15, and James 5:13. In Vine’s Complete Expository Dictionary, the word “making melody” is also psállō. In his dictionary, W.E. Vines asserts that psállō primarily means “to twitch, twang,” then, “to play a stringed instrument with the fingers.” With the Greek definitions given by Spiros Zodhiates and W.E. Vines, it is clear that the New Testament does not abhor, condemn, or forbid the accompaniment of musical instruments; but rather, the New Testament commands the accompaniment of musical instruments. Therefore, the exclusion of musical instruments is not the commandment of Yahweh; the exclusion of musical instruments is the commandment of men. Therefore, all who teach the exclusion of musical instruments need to: (1) repent (2) confess their sins before Yahweh Elohim and (3) obey the Holy Scripture. Let the saints of the Most High God sing the Book of Psalms exclusively, along with the accompaniment of musical instruments!